When you're fighting for press freedom, the greatest battle is for editorial control. It's like Excalibur, get hold of it and you're pretty well invincible. Tyrannical regimes all over the world and all through the ages have recognised this. News organisations are the first to be shut down or taken over in any coup; despots and closed societies rule by censorship and propaganda. 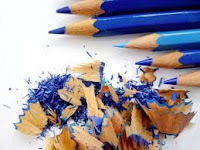 In this country we had decades of skirmishes over an editor's right to edit without interference from proprietor or trade union - and we have seen blank pages, pictureless pages and the non-appearance of whole editions in defence of that right. As the British press faces the biggest assault on its freedom in centuries, it is therefore strange to see a daily editor surrender control of his front page to newsagents. And to be praised for his 'brilliance' to boot. The Northern Echo appeared today with 'two front pages'. One has a photograph of Margaret Thatcher's coffin being borne down the aisle of St Paul's Cathedral, the other a photograph of a group of men round a protest sign hoisted on a van. The pages have the same titlepiece, splash head, inset picture of Thatcher and downpage head. But the teaser text differs and each page has the alternative as a little inset bottom left. There are very clearly two sides of the Margaret Thatcher story which need to be reflected. Today's edition of The Northern Echo therefore seeks to achieve a balance by publishing the two sides of the debate on the two sides of the paper. 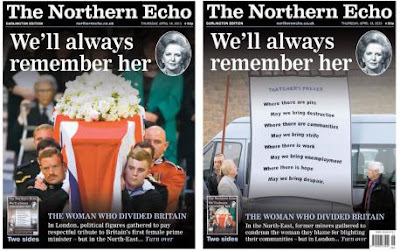 A letter has been sent to newsagents...explaining that there are two front pages on opposite sides of today's paper: one which captures the respectful tribute paid by political leaders in London; and one which shows former County Durham miners unfurling a banner condemning her economic record. Newsagents are free to choose which of the pages they wish to display on their shelves. An imaginative solution to an editorial dilemma? An example of an editor in tune with his readers? A "brilliant piece of creativity", as Barron's predecessor Peter Sands put it in his roundup of the papers? The Echo pages are well executed and eye-catching. 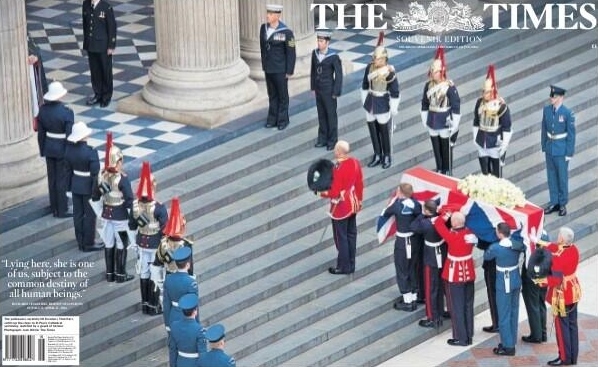 Better, for example, than The Times wraparound this morning in making full use of both ends of the paper to project strong ideas - The Times back page is just a flight of steps and a line of servicemen looking away from the camera. But what the Echo has not done is produce two front pages. The front can only ever be a right-hander. Magazines and catalogues sometimes create the impression of two issues in one by turning the back cover and a succession of inside pages upside down, so that whichever end the reader starts, they can continue reading in the normal way. But that isn't the case here. The coffin page is the Echo's true front, a fact reinforced by its iPad edition. If he wanted to send a different message to mining communities who still resent Thatcher, Barron could have used the time-honoured tool of the district/regional slip - indeed, the version I saw was slugged 'Darlington edition'. But no, invited newsagents who thought their customers might be upset by the front page to display the back instead. And in so doing, he was abdicating editorial responsibility and misleading some of his readers. A former Easington miner may have bought the 'protest' paper, but when he went to read it, he was still confronted by the Union Flag-draped coffin; whereas the stalwart Tory in North Yorkshire need never have looked at the miners' page at all. Barron may well have been inspired by the most honourable motives and a natural desire not to upset his readers, but it is an editor's job to make a decision and to defend it if necessary. Fudging and simultaneously telling readers 'I couldn't decide' is not the same thing. That leader is troubling from the word go. Here in the North-East, it has been a challenge to achieve the right balance on the coverage of Margaret Thatcher's death. So newspapers in Liverpool, Wales, Scotland, the Midlands had an easy ride? The divisive nature of the Thatcher era, the adulation and the hatred have been the leitmotifs of all of the coverage of the past ten days. Almost every editor met a similar challenge and did not shrink from it. Putting aside the papers that were fully for her (Mail) or against (Mirror), most nationals - which sell in the North-East as well as the South-East - managed to strike a balance without sacrificing their shop window. The rightwing broadsheets acknowledged that the lady made mistakes, some of which caused extreme hardship; left-leaning papers recognised that she had taken on issues dodged by successive governments and revived the economy. There is further evidence inside of the Echo's struggle with its conscience. Pages 2-8 are given over to the funeral and pictures of protesters are scattered throughout. Headlines, too, are crafted to avoid giving the impression that Thatcher was any kind of saint. But the text proves the impossibility of striking absolute balance; things have a habit of not working out quite as you expect. Pages 2 and 3 are devoted to the funeral itself, the straightest of headings, a factual read-through, pictures of the cathedral and a little sidebar on one of the pallbearers. With the absence of any anti-Thatcher content, there is a cutout picture of a protester in Goldthorpe, South Yorkshire. Page 4 is mostly pictures. At the top - and by far the biggest single image - is an effigy burning in Goldthorpe, but the eye is drawn irresistibly to the cutout of Amanda Thatcher and down to smaller pictures of Thatcher's old cabinet colleagues. The man in front of the Saltire celebrating in Scotland is almost lost bottom right. Of the eight quotes in a double column panel, only two express anti-Thatcher views and the basement is a local Tory MP giving his view of the service. The Echo sent its political correspondent out to gauge the mood on the streets around the cathedral. The result appears on page 5, accompanied by four pictures - a big one of Guards watching the gun carriage pass, two of protesters and one of a black-clad security sniper lurking behind a statue. Rob Merrick failed to find anyone to denounce Thatcher and no one even seemed bothered about the cost of the occasion. 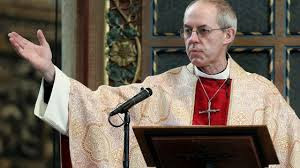 That'll be the Archbishop of Canterbury then? And so to the final page and the Richmond Conservative Club's toast to the Iron Lady. Well we'd probably guess that they'd think she was wonderful. Hardly balanced in the end then; for all his fretting, Barron produced a paper this morning that sent an overwhelmingly pro-Thatcher message. And that in turn raises the suspicion that the whole double front exercise was a cop out, window dressing, or a marketing ploy. That is a pity. The cover pages are excellent, and would have stood up to scrutiny without the public declaration that newsagents had been asked to make the final call. It is the leader that is weak. Unemployment figures reported on page 9 show that 23,000 of the 70,000 jobs lost in the past three months went from his circulation area, and the business splash on page 54 is about the possibility of two surface mines being opened in County Durham. Perhaps one or both of these could have been brought forward in place of cafe or Con Club chitchat? One final thought: the trouble with 'one-off' specials is that they can so easily turn from exception to precedent. Having once been given the licence to choose which cover to display, newsagents might just decide in future that the football would sell better than the splash.